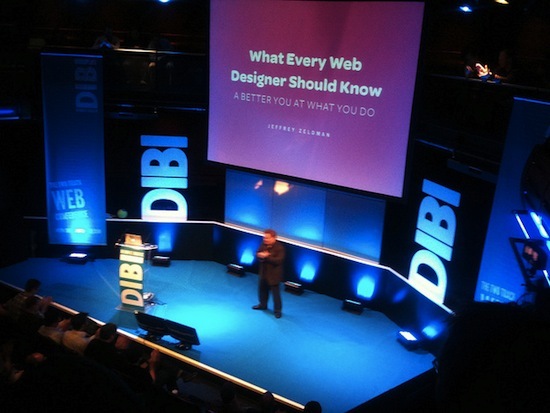 Yesterday I was lucky enough to attend DIBI—a two track web conference in Gateshead. And quite honestly it was great. Gavin Elliott and Codeworks have done an all-round brilliant job, hiring a fantastic venue, looking after everyone incredibly well, and most of all luring top-notch speakers to speak outside of the London/Brighton/Bristol triangle. I also attended last year, and wondered how they could top a line-up of Andy Clarke, Simon Collison, Dan Rubin… but with Jeremy Keith, Jared Spool, Jeffrey Zeldman, et al. they sure did. And again the details weren't left to chance. For example the food—both snacks during breaks and a real proper lunch was included in the price of the ticket (how many conferences do that? )—was delicious, but the thing that struck me most was a little thing on the signage behind the main stage. Look at the large white on-end DIBI signs. Sure it would have been easy to buy two on-end DIBI signs. But the thing is they didn't. Check the Bs. Yep, they're different. So whichever side you're sitting the asymmetric letter B is the correct way round as you look at it. My point is, if details like this aren't overlooked, you just know everything else is going to be spot-on too. That said I do have a grumbling, alas while it's a huge part of DIBI it's unfortunately out of Gavin's direct control. And it's the fact that some speakers simply fail to deliver. I'm not sure if it's because as an attendee I have a higher expectation of speakers that have a high standing in the web-scene. I mean if I follow x on Twitter, or subscribe to their blog and basically have a good idea of what they're up to, or what they've been researching and thinking about lately, I probably expect more from them than someone that I know diddly-squat about. That said at most conferences that I've attended (certainly not just DIBI) there has been a talk that has left me feeling disappointed. If you've been to a conference perhaps you've had the same experience? The sessions that I've sat through that've been like this have felt disjointed, lacked cohesion, and seem rushed in their inception; a sneeze of bullet points, a jumble of random tweets. I think it's a catch-22 for the conference organisers though. The presence of these, albeit under performing, 'web-celebs' [sic] sell tickets and get people through the doors. I certainly don't have the answers, and most definitely couldn't do any better than even the worst session that I've sat through. However as productions like Dan Benjamin's 5by5 rise in popularity—where it feels like every week you can fill your iPod with fantastic podcasts to enjoy as/when/where you please and for free—I will be even more carefully considering which conferences I choose to attend in future. However DIBI you, my friend can sleep easy, overall you were excellent.